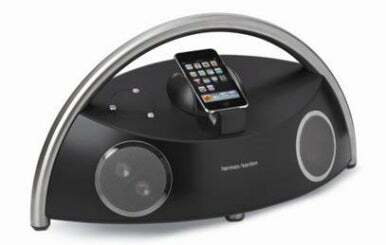 Audio vendor Harman Kardon on Wednesday announced a new version of the company's Go+Play docking speaker system. The new Go+Play Micro, which has an official price of $399, uses a design similar to that of the original version but in a smaller, more portable package that's 20 inches wide, 9 inches deep, and 9.5 inches tall and weighs 8.6 pounds. In addition to its unique black-and-metal design, the Go+Play Micro sports five speaker drivers: two for the left channel, two for the right, and a "subwoofer" for lower frequencies. Unlike the original Go+Play, which held your iPod horizontally, making it difficult to see the iPod's screen, the Micro features an angled top and dock cradle for better accessibility. Also new to the Micro version is full compatibility with the iPhone and iPod touch. Updated 4/29/2010, 10:14am: Corrected price.